Today's WFMW is all about blogging tips. Be sure to check out the links over there - you'll find all sorts of helpful info! When I very first started blogging, I e-mailed Kristen at We Are THAT Family and asked her for any suggestions for my blog. She graciously answered and gave me some great advice! In that message, she mentioned that it had taken a few months to find her *voice* on her blog. That stuck with me. I do think I found my *voice* after 3-4 months of blogging, but you could certainly find yours much faster! On my blog, I write in the voice that I use to talk to friends. I like to think that when you stop by here, you are stopping over for coffee or tea (and chocolate!) and we're chatting. That's why my writing ain't always gonna be grammatically correct! ;) And you'll find me throwing in an LOL here and there along with a :) and an incorrect use of ... for a pause. Of course I don't actually say "LOL" in real life, but I do laugh a lot and want to convey that! My voice has changed a little over time. It's the same friend *voice* but with a little more knowledge and confidence. We do change over time! If our blogs are a reflection of us, then we should expect our blogs to change over time as well. That's OK! Do you read certain blogs just because of the *voice*? Have you found your *voice* on your own blog? 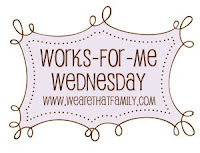 Be sure to stop back at We Are THAT Family (written in a warm, friendly, humorous voice) to see other great blogging tips today! Great suggestions! I don't think I've quite found my voice yet, but I think you're right about our voices growing and changing as we do personally. Great advice! I started my blog because my husband was dealing with severe arthritis. I was trying to write a children's book, but all that came out was stuff about chronic illness. That started my voice, although it has changed some, especially since I now blog about other things. I hope I have found my voice. I should ask aournd to see how I come across. I know that I have quit reading some blogs because their voice ends up sounding like my mother in law. I am sure that they do know more than me, but just don't be so bossy about it. Any way, great tip. No I must reflect on my voice. Check out my blog and tell me what you think. I agree! I even blogged about finding my blog voice about two posts into the whole thing. Wasn't so sure it was going to happen. I'm so glad I persisted. It was tempting to give up at first because I didn't really know which way I wanted to go with it. Too many things on my mind. I'm loving it now and still working on a few things. But getting better and more honed in on how I want to do it as I go along. To newbies - don't give up! Give yourself time to find your voice by actually getting started. Don't wait till you've got it all figured out to get going. Thank you thank you thank you! this is exactly the topic I needed to see today! I am currently trying to figure out how to REALLY blog, and this post helped me a lot. I have had my blog open for about a year and a half, but I am just now getting into making it a real project LOL! Your honesty is always appreciated. PS. as I read this I am having coffee w/ chocolate creamer so I really did LOL at that part of your post! Well ever since I actually "heard" your voice, I hear you reading it to me every time I come by now. And it makes it more fun! And I'm like you. I write like I speak in real life. There is definitely nothing "fake" about my blog! Hee! Hee! I say Hee Hee in real life by the way. And Ha! ha! Big an over use of exclamation marks does not mean that I'm yelling at you size hugs! I write for two different blogs. Susie's Homemade is all mine and that is my homemaker voice. The other blog I write for is one with a couple of friends called At Work, At Play or At Home All Day . I explore all my womanly aspects on that blog. Figuring out my voice has been a real problem for me -- and a large part of the reason that my blogging has been in fits and starts (well, that and some serious illness getting in the way over the last year and a half). This was a helpful post, I probably need to be more patient and stick with it more so to give myself time to find that elusive voice! So true ... it took me four attempts at blogging to "find my voice" ... but since I started Pleasing to You, I feel like I'm really connecting who I am with who I want to be and helping others along the way.